The Maya civilization is well-known for its elaborate temples, sophisticated writing system, and mathematical and astronomical developments, yet the civilization's origins remain something of a mystery. A new University of Arizona study to be published in the journal Science challenges the two prevailing theories on how the ancient civilization began, suggesting its origins are more complex than previously thought. Anthropologists typically fall into one of two competing camps with regard to the origins of Maya civilization. The first camp believes that it developed almost entirely on its own in the jungles of what is now Guatemala and southern Mexico. The second believes that the Maya civilization developed as the result of direct influences from the older Olmec civilization and its center of La Venta. It's likely that neither of those theories tells the full story, according to findings by a team of archaeologists led by UA husband-and-wife anthropologists Takeshi Inomata and Daniela Triadan. "We really focused on the beginning of this civilization and how this remarkable civilization developed," said Inomata, UA professor of anthropology and the study's lead author. 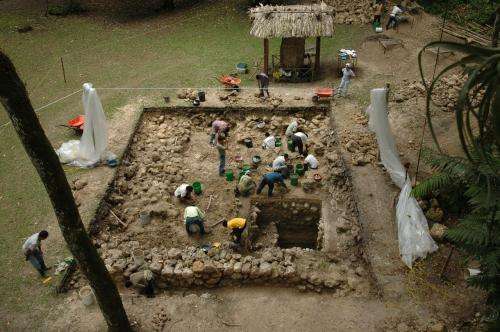 In their excavations at Ceibal, an ancient Maya site in Guatemala, researchers found that Ceibal actually predates the growth of La Venta as a major center by as much as 200 years, suggesting that La Venta could not have been the prevailing influence over early Mayan development. That does not make the Maya civilization older than the Olmec civilization – since Olmec had another center prior to La Venta – nor does it prove that the Maya civilization developed entirely independently, researchers say. What it does indicate, they say, is that both Ceibal and La Venta probably participated in a broader cultural shift taking place in the period between 1,150-800 B.C. "We're saying that the scenario of early Maya culture is really more complex than we thought," said UA anthropology graduate student Victor Castillo, who co-authored the paper with Inomata and Triadan. "We have this idea of the origin of Maya civilization as an indigenous development, and we have this other idea that it was an external influence that triggered the social complexity of Maya civilization. We're now thinking it's not actually black and white," Castillo said. There is no denying the striking similarities between Ceibal and La Venta, such as evidence of similar ritual practices and the presence of similar architecture – namely the pyramids that would come to be the hallmark of Mesoamerican civilization but did not exist at the earlier Olmec center of San Lorenzo. However, researchers don't think this is the case of simply one site mimicking the other. Rather, they suspect that both the Maya site of Ceibal and the Olmec site of La Venta were parts of a more geographically far-reaching cultural shift that occurred around 1,000 B.C., about the time when the Olmec center was transitioning from San Lorenzo to La Venta. "Basically, there was a major social change happening from the southern Maya lowlands to possibly the coast of Chiapas and the southern Gulf Coast, and this site of Ceibal was a part of that broader social change," Inomata said. "The emergence of a new form of society – with new architecture, with new rituals – became really the important basis for all later Mesoamerican civilizations." 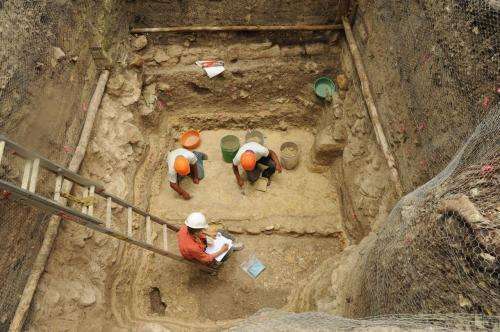 The Science paper, titled "Early Ceremonial Constructions at Ceibal, Guatemala, and the Origins of Lowland Maya Civilization," is based on seven years of excavations at Ceibal. Additional authors of the paper include Japanese researchers Kazuo Aoyama of the University of Ibaraki, Mito and Hitoshi Yonenobu of the Naruto University of Education, Tokushima. "We were looking at the emergence of specific cultural traits that were shared by many of those Mesoamerican centers, particularly the form of rituals and the construction of the pyramids," Inomata said. "This gives us a new idea about the beginning of Maya civilization, and it also tells us about how common traits shared by many different Mesoamerican civilizations emerged during that time." More information: "Early Ceremonial Constructions at Ceibal, Guatemala, and the Origins of Lowland Maya Civilization," by	T. Inomata et al. Science, 2013.